Researchers from the University of Nebraska-Lincoln, University of Illinois at Urbana-Champaign, and Russia’s Saratov State Technical University have shown that adding a graphene nanoribbons to gas sensors can significantly increase their sensitivity compared to traditional ones. The team integrated the nano-ribbons into the circuity of the gas sensor where it reportedly responded about 100 times more sensitively to molecules than did sensors featuring even the best performing carbon-based materials. 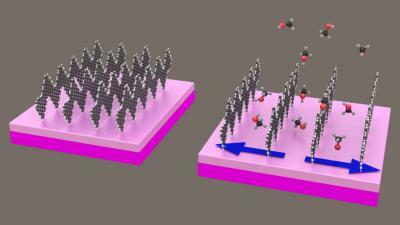 “With multiple sensors on a chip, we were able to demonstrate that we can differentiate between molecules that have nearly the same chemical nature,” said the study author and associate professor of chemistry at the University of Nebraska. “For example, we can tell methanol and ethanol apart. So these sensors based on graphene nano-ribbons can be not only sensitive but also selective”. The team found a way around the obstacle of a lack of a bandgap by initially fabricating the nanoribbons by strategically snapping together molecules on certain types of solid surfaces followed by implementing a novel method that entailed mass producing these ribbons in a liquid solution. The final step was adding benzene rings, circular molecules containing six atoms of both carbon and hydrogen, placed onto either side of a first-generation nano-ribbon. The rings widened the ribbon reducing its band gap and enhancing its ability to conduct electricity. Ultimately, the scientists suspect this prototype’s unique performance was partly due to an “unusual” interaction between the ribbons and the gas molecules. Unlike its predecessors, the team’s nanoribbons stand vertically rather than lying flat on a surface. The team has proposed that gas molecules can nudge these rows apart, effectively lengthening the gaps between nano-ribbons that electrons must jump to conduct electricity.